Ashigaru gains "subroutine End the run." for each card in HQ. The way past is to go a different way. This ICE is an absolute nightmare for Runners to encounter. Even with Corroder, Cerberus "Lady" H1, and Battering Ram this is horribly taxing. In a normal, 5 card max hand size deck, it will cost Corroder 7 to break. With Cerberus "Lady" H1, you'll get one solid break against Ashigaru but next run you're screwed. Battering Ram also costs 7 to break. Just under D4v1d range, this makes even Quetzal shudder. Ashigaru is a great ICE, however its usefulness is lessened by its cost: 9 to rez is absolutely painful in some decks, and at 3 influence it's hard to splash in many decks outside Jinteki. If you do decide to splash for it though, you probably won't regret it for long. This ICE is best utilized in decks that can make lots of money: Jinteki: Replicating Perfection comes to mind first and foremost, where rampant Sundews can earn you your money back pretty fast. Ashigaru could see some play in NBN: The World is Yours*, but the influence cost hurts still. Janky Cerebral Imaging: Infinite Frontiers decks could run this for ensuing hilarity. Ashigaru could work well with Chum and Sensei or anything else to extend the number of subroutines/taxing potential. Midway Station Grid and Ashigaru sounds like hell on Earth to encounter. 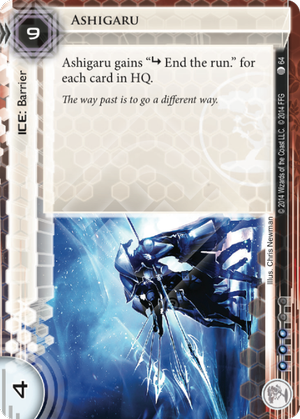 Overall, Ashigaru is a super taxing piece of ICE, and while it might have a rough influence and rez cost, the taxing potential on the Runner could very well outweigh the initial cost.